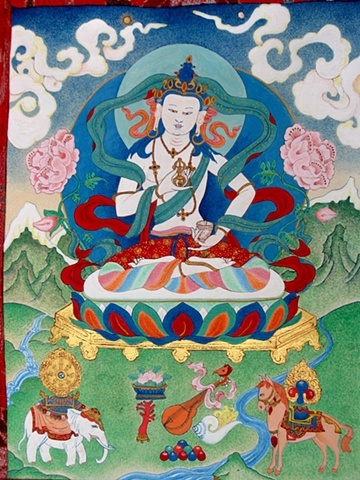 Vajrasattva is the Bodhisattva of purification. He holds a vajra and a bell. This is a small thangka I took along on travels. I used the traditional dot method for shading this sweet painting. I like to paint a VajraSattva as the year closes to purify negativity from the previous year and ask forgiveness for any ways I may have harmed others. Then I can start the new year all fresh and clean.